Paddy Hills @ 38 South Buona Vista Road | JACQSOWHAT: Food. Travel. Lifestyle. Paddy Hills is probably one of the newest kid on the block in the explosive cafe scene, where new cafe sprung up almost every month. Paddy Hills have been generating a hype across social media ever since it's opening earlier this year, especially for it's instagram-worthy Hotcake. This new cafe serves food with a creative spin on Australian-Japanese international fusion along w specialty coffee & hand brew bar. Paddy Hills has taken over the space where the famous duck rice stall used to be at and it's none other than Lim Seng Lee Duck Rice. It is located at 38 South Buona Vista Road, slightly off the way from train stations but I like how it's feels like an escape from the bustling city. The interior of the cafe is one of the prettiest yet chic concept I have seen. The store is rather spacious with the coffee bar smack in the middle, while sofa and wooden tables on both sides. I like how several interior aspect is used - brick walls, sofa, wooden furnitures as well as a bronze bar table which makes it classy together. They have different menu for breakfast (0830-1730), lunch (1130-1730) and dinner which is available evening onward. The menu is pretty extensive, ranging from mains to desserts. But one of the reason we are here is definitely for the Berry Ricotta Hotcake. Iced Mocha $7.50 - Unfortunately this iced coffee didn't like how it should be. I hate to say it's the worst iced mocha we had, the entire drink just tasted weird. Decided to try out Cauliflower Fritters $12 as the concept is somewhat similar to Sin Lee Food's Aburi Broccoli Salad. Cauliflower was out of stock on the day of our visit so they replaced it with Broccoli. The rendition at Paddy hills was disappointing, nothing compared Sin Lee's. The paprika salt and masala yogurt didn't help much in the flavour. One of the highlight that we are here for, Berry Ricotta Hotcake $19. 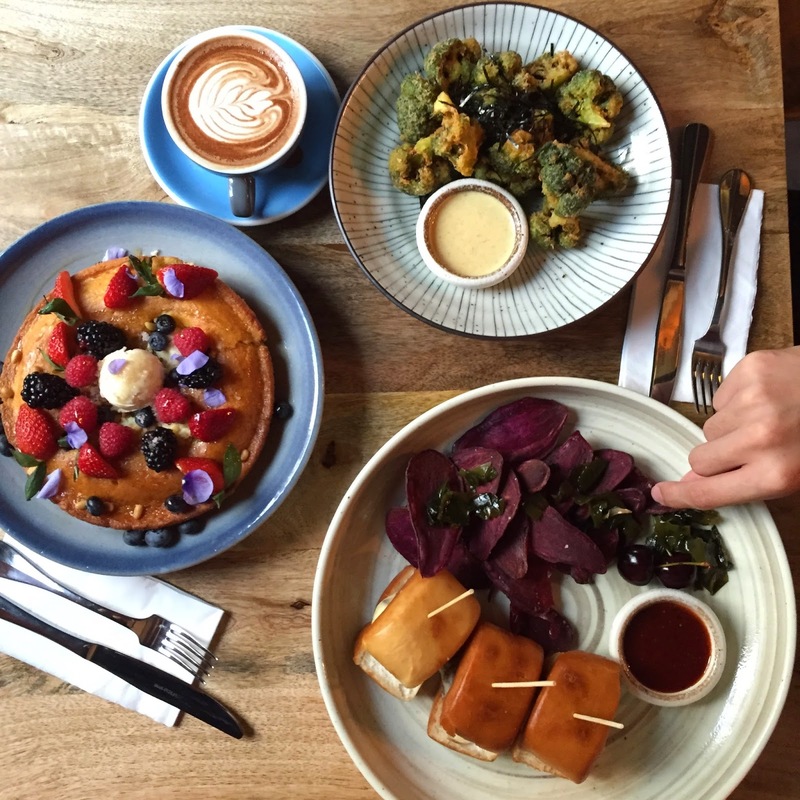 This colourful plate of dish has been surfacing all over on Instagram. This dish looks pretty with a generous serving of berries, blueberry sugar, pine nuts, mascarpone and drizzle over with maple syrup. The edge of the hot cake was crispy and the entire dish has this buttery aroma that easily whet your appetite. Overall, I would call it sponge cake instead with it's thickness and texture. But note that this beautiful yet simple dish is a whooping 19 bucks. *We actually arrived to found out that all hotcakes were sold out for the day. We expressed our disappointment to owner, Bryan as we came from afar for this. Right after, he prompted one of his staff to head out to get a ingredient as it was used up. And 15mins later, we got this. Thank you for making this possible. One of the main from the lunch menu which we thought was unique, Golden Man Tou Sliders $23. It consist of beef patty w 3 cheese, purple sweet potato fries, homemade bbq sauce, pickled shallot and cherries. We were rather disappointed at the portion given, is this really worth 23 bucks? Includes 3 small mantou with 3 mini beef patty and a couple of sweet potato chips. I would say it's ridiculously expensive & nothing fantastic. Capped off the meal with Earl Grey Lollies $16, compliments from shop owner, Bryan. A unique combination of yuzu jelly, earl grey lolly, vanilla foam, raspberry dust, crushed pistachio and sea salt caramel marcona almonds. The earl grey flavour was distinctive but the texture of the lollies wasn't to my liking. It felt like a mousse pudding without any punch. As you can see, dining at Paddy Hills isn't cheap at all. The portion and quality didn't quite make up the extra bucks that we're forking out. I believe if Paddy Hills keep their prices slightly more affordable, students and hipsters would stream here. Though food concept is unique, I won't be rushing back to revisit any sooner.